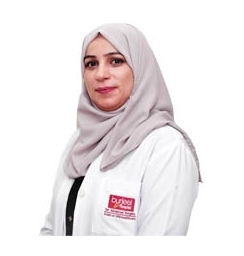 Dr. Maisaa Al Sulaiman is a specialist family medicine doctor who has over 15 years of experience in her field. She has an interest in the management of chronic and acute diseases, screening & prevention and wellness promotion for all age groups. Dr.Al Sulaiman has practiced in different clinics and hospitals in the UAE . She is an expert in treating patients with multiple types of medical problems, normal, low and high-risk pregnancies, chronic diseases, emergency cases, child health, cosmetic wound suturing, family planning, vaccinations, loops insertion and removal, pap smear ultrasound & transvaginal scans.